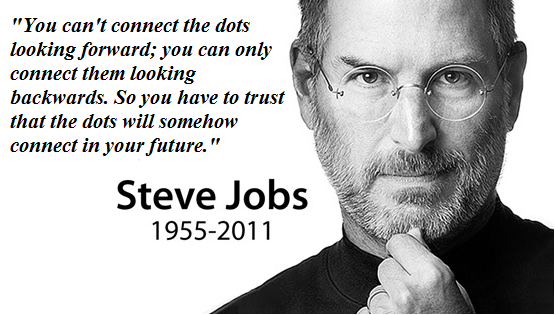 My favourite speech of all time is Steve Job's 2005 Stanford speech about finding what you love, going after them and seeing the dots connect. When people ask me what I imagine my life will be like in 15 years time, I find it very hard to answer. And it is not because I have a lot to say or I'm trying to simplify the answer in my head. It's simply that my mind goes blank. As I already explained in a poem 6 years ago - I Can Only Imagine - looking back 15 years ago and what I felt my life would be in 15 years time; taking that and comparing it with what my life now is when those 15 years have passed, I can say it's useless to predict what you will be in 15 years time. You can't connect the dots in your life forward. You can't predict the circumstances you will face in life or even how your career, the part of your life you most carefully plan, with turn out. There are too many things that will shape who you will be in 15 years time and a lot of them don't even exist now. But the one thing you can and should do is to give your life a sense of direction. Do more of the things that give you fulfillment. Fill your life with the right kind of dots. Rather than trying to predict what your life will be in 15 years time, plotting the future, make the most of the present. Do the things you have passion for. Think beyond immediate reward and stop all peer comparison. Don't live just for gain because the biggest gains are results of the things you never thought would bring you any money, things you did for fun. As long as you fill your life with the right dots and live a very passionate life, when the dots all connect in the future it would look like an unbelievable story.